While doubts are growing that the next leg of the Volvo Ocean race – the much-awaited return to Auckland next month – will see an Emirates Team New Zealand win with Camper or even a repeat of that thrilling 1990 finishing joust on the Waitemata Harbour between Grant Dalton’s Fisher & Paykel and Peter Blake’s Steinlager 2, a tired but still gung-ho skipper Chris Nicholson begged to differ. 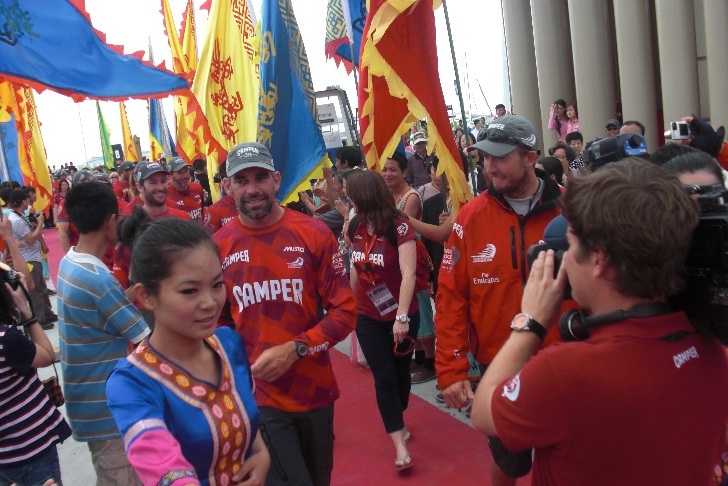 Late last night, Camper settled for third in the race to Sanya, China, after two tactical errors in the Straits of Malacca – ETNZ head Grant Dalton called them "unacceptable" – cost them dearly in this leg. Race leader Telefonica completed a third consecutive stage win with Groupama second and Camper third. Camper finished three and a half hours behind Telefonica. Puma crossed late last night with Abu Dhabi further back. "I think it’s fair to say that we are under-performing at this point," said Dalton. "We made some tactical mistakes which are not acceptable. It’s a long race but you don’t want to drop off too much at this stage. I thought it was a leg we should have won but, unless something changes, we won’t win it." Camper made up ground after those mistakes, refreshing belief that it is the fastest boat upwind. Tired crews on all yachts tacked hard, cutting down sleep as all hands have to be above decks, and it takes about 15 minutes to prepare to tack. Afterwards, the boat is re-stacked, with sails and other gear moved to the windward side, meaning little time for rest. "It’s been tough dodging all the stuff in the water too," a tired-sounding Nicholson said. "We got caught up with a fishing net on our keel for a while and had to get rid of that. It doesn’t matter how fast you are going, you’re not going to be going far dragging round a fishing net." The myriad of small fishing boats in the region, some without lights and without much of a radar signature, also made sailing a highly watchful affair. Nicholson said Camper had sustained some small damage to the bow "when we hit something, I don’t know what it was. It’s not bad…but this is a surreal part of the world". The biggest issues facing Camper now appear to be the boat’s lack of speed when reaching. Camper seems a highly reliable and durable boat but has not been able to match Telefonica’s speed. "I think there is no doubt we are slower when reaching," said Dalton. "But having said that, I don’t think this leg [to Sanya] has been about boat speed." Nicholson also believes things will change on the way to Auckland. "Reaching should be a lot better. Almost everything that has gone before has been on relatively flat water, but now we are getting into the big ocean waves and conditions and I think that will see us come back good again. Things change in those conditions – you can be faster at different angles. They are big waves and a lot can happen." Some in the sailing fraternity say that Camper should be sticking closer to the overall fleet, rather than breaking off trying to find weather and current breaks. However, Nicholson, asked if they had to break away to find a counter to lesser boat speed said: "That is exactly right. We have not been quite as quick on certain angles. We have to take calculated risks and understand that we are a bit slower." Telefonica increased their lead in the overall standings, with Camper staying second. Telefonica had 71 points overall at the beginning of this stage, Camper 64 and Groupama 51. There are still stages to Auckland, Itajai, Miami, Lisbon, Lorient and Galway where the race finishes in July.